Be the first to share your favorite memory, photo or story of Georgie. This memorial page is dedicated for family, friends and future generations to celebrate the life of their loved one. Georgie Ellen Camper, 97, of Peoria passed away Tuesday, January 22, 2019 at Proctor Place in Peoria. She was born February 19, 1921 in Peoria to Charles Jay and Lucille Frances Cox Cantwell. Her parents and grandparents preceded her in death. She is survived by her son, John Christopher (Brenda) Camper of Peoria, IL; daughter, Deborah Ellen Randall of Baytown, TX; five grandchildren; fourteen great-grandchildren; one great-great-granddaughter; many step-family members; sister, Sharon (Bill Jeffries) Owen of Peoria, IL and brother, Richard Cantwell of Dunlap, CA. Georgie was one of the original Rosie the Riveters and worked as a Librarian for the Illinois Valley Library System; retiring in December 1983. 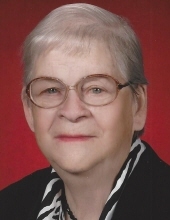 She was a lifelong member of the Peoria Heights Congregational Church where a memorial service will be held on Saturday, February 2, 2019 at 11:30 a.m. with a visitation one-hour prior at the church. There will be a celebration of life following the services at the church. In lieu of flowers memorials may be made to the church in her name. To send flowers or a remembrance gift to the family of Georgie Camper, please visit our Tribute Store. "Email Address" would like to share the life celebration of Georgie Camper. Click on the "link" to go to share a favorite memory or leave a condolence message for the family.